On a hike through remote mountain forests, it's not unusual to find tracks of deer, elk or moose. Worldwide, 47 species populate taxonomic family Cervidae, commonly known as the deer family, ranging from 20 pounds to 1,800 pounds. Deer, elk and moose are the most common in North America, and you'll find plenty of differences to identify them in the wild. The smallest species of the deer family native to North America are white-tailed deer, which mature at 100 to 300 pounds. Their range includes grasslands and desert areas as well as forest. They move through their environment at speeds up to 30 miles per hour; a hungry deer can clear a 10-foot fence to nibble on your garden's bounty. Males grow spiky antlers during spring and summer, and shed them during the winter. Deer vocalizations are rare, mostly consisting of a faint high-pitched call that sounds like "oooh." Elk have shaggy necks and shoulder that rise about 5 feet from the ground and antlers that can tower 4 feet above their heads, giving them astounding heights up to 9 feet. The massive animals can weigh up to 1,100 pounds. They live in mountainous forests throughout the continent. Females have no antlers and may travel in herds of more than 1,000 individuals. Male elk are extremely vocal during autumn breeding season, bugling loudly in the morning and evening. Elk can run up to 45 miles per hour. The largest members of the deer family, moose can run up to 35 miles per hour. 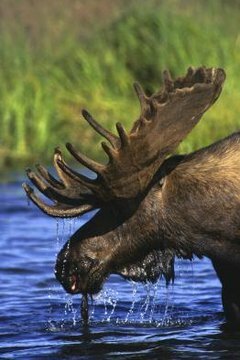 Unlike deer or elk, you're just as likely to see moose in the water as on land. They swim up to 6 miles per hour -- twice as fast as a human can row a boat. Their shoulders are about 6 feet high, and antlers can spread 6 feet wide. Moose have bulbous noses and a flap of skin on their throats known as bells. They are distributed in remote forests from Colorado north through Canada and Alaska. They make a mating call that sounds like an untrained person blowing a tuba. You can easily tell if tracks you see while hiking belong to a deer, moose or elk. Moose and deer both make heart-shaped tracks, with the toe of each half of the hoof coming to a distinct point. Elk tracks are more similar to the silhouette of a tooth. The end of each segment is rounded, not pointed, and the halves of the hoof remain parallel to one another rather than point inward.